This activity connects number theory and geometry. Your challenge: predict the shape that will result from any combination of angle and distance variables. 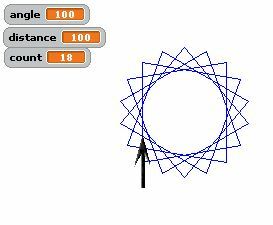 Mathematical Experiments with Polystar By Dan Lynn Watt In this activity you can explore the behavior of a script, Polystar, to create geometric designs using two variables, distance and angle. The behavior of the script and specific challenges are described in an attached document, Mathematical Experiments with Polystar. What can it look like to build deep math understanding through Scratch, as a teacher and as a student? Jennifer describes how she used Scratch to help students with language-based disabilities boost their confidence and math skills. Corrie Meyer and Kristin Judd, math teachers at Parkway West High, tried introducing concepts of geometry differently this year - by allowing students to create games and stories using Scratch.